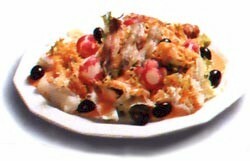 Xatò is a salad that combines sea food, fruit and vegetables in a nut-based sauce. The xatonada is a traditional food, rooted in the traditions of the regions of the Garraf and the Penedès, to the south of Barcelona. The xató route begins in Sitges before heading inland to Sant Pere de Ribes and Vilafranca del Penedès, swinging south-west to El Vendrell then returning to the coast at Vilanova i la Geltrú. There is a recipe for each town of the Xató route.